G.E.M. Going The Extra Mile June 2017 - Peabody Engineering & Supply, Inc. 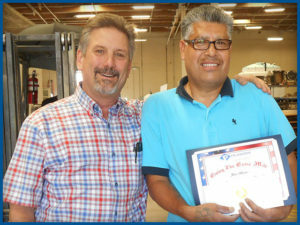 Nominated by his fellow Peabody Team Members – Congratulations to Jose Bravo, who works in our Custom Fiberglass Fabrication Department, on being June 2017 G.E.M. Winner! Jose is a vital part of the FRP Team and works hard every day. He is a good leader and role model for his co-workers & produce3s consistently excellent products. Jose has worked extra hard this month, despite getting sick an being short of team members who were also sick, to reach the goals we as a company have had. He is a good co-worker! Always comes early. His job is to time early his work machinary, tools, correctly, he knows how to speak to people. He says please. He is responsible and honest man.